Practical training in Accounting and Taxation is most important area to be considered in current context of business even though there are numbers of local and International Institutions in Sri Lanka to get qualifications in accounting and related subjects, said by P. Guruge, chief guest and retired deputy commissioner of Inland revenue and formal fiscal advisor to the Ministry of Finance at the certificate award ceremony held on recently at Central Bank, Rajagiriya. 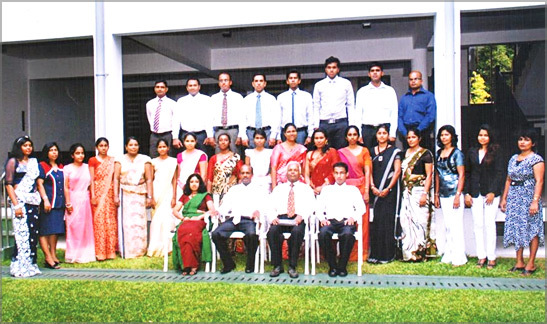 D P R Training Institute, an Institute providing practical training in accounting organized the event to award certificate for students who completed their practical training at DPR Training Institute at Rodney Street, Cotta Road, Colombo 8. The objective of the Institute is to provide practical training in Accounting and Taxation for those who have no practical experience, especially students looking to gain a foothold into the job market in accounting and those who are currently employed but have limited practical experience in accounting and taxation. Further, this course is helpful to entrepreneurs as well. Institute is keen in providing practical experience in accountancy, bookkeeping, labour laws, cash and banking procedures, inventory, taxation, auditing, company incorporation, import and export procedures and budgeting. Guruge further said that adding a another certificate to their certificates bag is not much important but gaining practical knowledge with theoretical knowledge is the key factor to be considered and further said that DPR Training Institute has initiated to provide practical training in proper manner within short period of time at very reasonable rate and qualifications are not a barrier to study the course and course is suitable for business owners as well. Bharatha Subasinghe, chief executive officer and lecturer said that it is a very difficult task in finding practical experience employees in finance sector due to lack of practical training opportunities in Sri Lanka and most of accounts executive may involve in one activity of accounts departments but they have no idea about other activities of accounts department. Therefore, DPR has initiated to conduct practical training courses. Subasinghe further said that to fill the gap of less opportunity in practical training in Sri Lanka DPR Training Institute will strength their capacity to train more staff in the field of accounting since it will benefit to both employee and employer. Amila Alawathugoda, Managing Director of advertising company and Mrs. Rajika Pathirana account’s executive of a tour company addressed the ceremony on behalf of all the students and said that the training they gathered during the course is very much helpful them. Certificates were awarded to all students by P. Guruge and course coordinator and lecturer Ruwan Thilakasiri and Ms. Gothami Abeythilake too participated for the event.